After making his debut understudying the title role in Disney's Aladdin, Rodney Ingram stars as Raoul, Vicomte de Chagny, in the iconic Broadway production of The Phantom of the Opera. Rodney grew up in Mexico, moved to Paris at 16 to finish high school, then moved to NYC to attend CAP 21. Read on as the charming young star talks keeping the Phantom legacy both pure and fresh, bombing his college theatre auditions, and co-founding The Doughnut Dudes. The first time I saw Phantom of the Opera live was the Las Vegas production in 2006, starring Sierra Boggess before I knew what a Sierra Boggess was. There is a reason this production is the longest running musical in Broadway’s history: the high level of artistic integrity to the original direction, and everybody’s dedication to uphold it. I am continually amazed by the precision in which this material is handled to keep it as pristine and true to form as it was in 1988. And it might seem paradoxical, but there is a freshness that comes nightly when everybody at the Majestic, both onstage and off, are working together to present a piece of theatre that we all know is very special, and part of such a remarkable legacy. I think about this a lot particularly about my Raoul, as it is far from the first time that somebody has taken on this role. 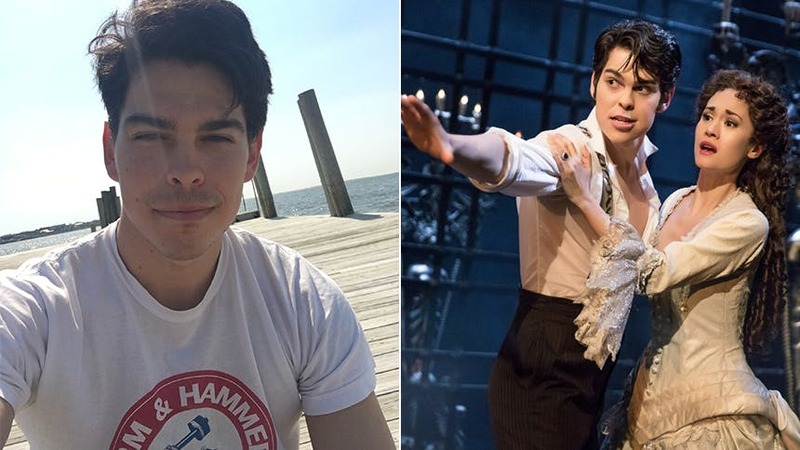 So my Raoul is different from any other, not because I’m making decidedly different choices, but by virtue of who I am and “trying on” the character, inhabiting his reality, what he wants, and the circumstances in which he finds himself. And I continue to discover how to strike that balance in a way that is both integral to who I am, and in service of the piece. I always think that next year will be the year that I give some degree of thought and effort in what my Halloween costume should be. I often reluctantly rummage through my closet last-minute to find something to wear that is costume-adjacent enough so that it’s not weird that I came to your Halloween party to eat your candy. I had the good fortune of wearing some awesome and elaborate costumes while at Aladdin. However, there was one look in my ensemble track that was my least becoming: A bright purple sequined suit and a bright blond wig. I took solace in that I only had to be on stage in that outfit for under a minute during a sequence in “Friend Like Me.” The disdain I had for how I looked in this wig caught on, and it became a mission of several of the dressers (particularly one who shall remain nameless although her initials are L.J.) to sneak up on me and take videos of me in the wig and post them online tagging #blondney. Somewhere in cyberspace exist far too many videos of me in a blonde wig and purple suit angrily defending myself from the merciless and seemingly omnipresent gaze of the camera. There are way too many that come to mind most all of them involving food! You could often find me on Rue de Buci in the left bank eating a tarte aux framboises or a pain au chocolat aux amandes. But a unique bite to have in Paris is to grab a falafel in the Marais district. Trust me! Many people go to Paris and make sure to hit all the famous sights, which is great. But I would advise to allow time to wander and get lost. Discover some of the parks and gardens and the amazing architecture preferably with some viennoiserie in hand. My first apartment in New York was in Chinatown and it had rooftop access. So, I actually sang there regularly to either warm-up or go through some of my audition repertoire so as to not disturb the neighbors from within my apartment. I’m fairly certain I disturbed more neighbors on the rooftop, but at least I was anonymous. I think. My most memorable audition story is about a collection of auditions I had in hopes of getting into a Musical Theatre college program. The long and short of it is that I had absolutely no idea what I was doing. I sang songs that neither suited my voice nor my type and I showed up to the dance calls wearing jeans and sneakers. I still remember one dance auditioner telling us to finish the combination with a “tombé, pas de bourrée, glissade, assemblé.” I have since learned that those seemingly inane mutterings are technical ballet steps. But when it came time for me to do the combination, I thought it would suffice for me to fake a smile into the mirror give a double “thumbs up” sign while doing hip circles. Evidently, my creativity and (uh) utter lack of dance training was not rewarded and I didn’t get into ANY musical theatre program that I applied to. I thought that I gave theatre a shot, and that I wasn’t cut out for it in light of my inexperience and the vast competition. But ask me now to do those steps; I will never forget them. Doughnuts. Spelled the traditional way, please. America may run on it, but Dunkin certainly hasn’t done any favors to the Doughnut Community by popularizing the spelling of their so-called “Donuts.” It is the equivalent of spelling “nite” to describe the post-evening time after which the sun sets. I simply won’t stand for it. But I digress; these holed, glazed, deep-fried (never baked) confections of the circular variety are the quintessential food that elevates what could have been mere bread to its utmost potential. As co-founder of The Doughnut Dudes™, I have been known to host parties in which we make fresh doughnuts from scratch to celebrate doughy comestible awareness. Please visit thedoughnutdudes.com for pictures and video of our past parties and to stay abreast of the future events. Don't miss Rodney Ingram as Raoul in The Phantom of the Opera at Broadway's Majestic Theatre. Ranking 12 Absolutely Epic YouTube Performances of Chess' "Someone Else's Story"